Singer Sonu Nigam, who has collaborated with Sachin Tendulkar for the iconic cricketer's debut track 'Cricket waali beat', says he is a very good singer. The song will have its world TV premiere on the grand finale of singing TV reality show 'Indian Idol 9' on Sunday night on Sony Entertainment Television. 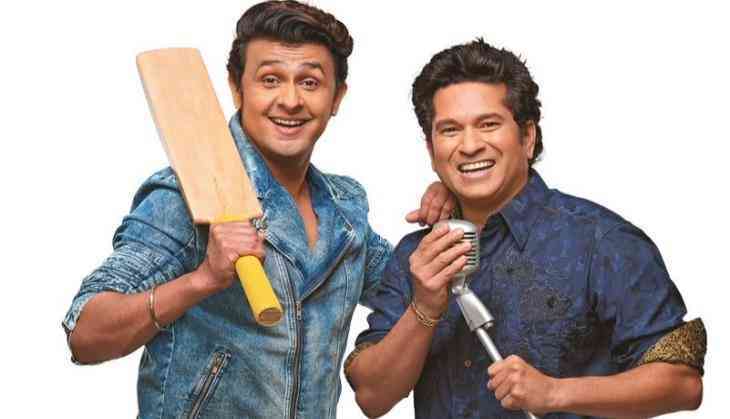 Sonu can now vouch for Tendulkar's singing skill. 'He is a very good singer. We did not use pitch corrector on his voice as he was singing in the right sur (tone) and (despite being) the shy person that he is, he got extremely comfortable the moment I kind of increased the masti (fun) quotient while we were shooting the video. It was wonderful and I am very happy that people are loving the song,' the singer said. Sonu judges 'Indian Idol 9' with composer Annu Malik and choreographer-director Farah Khan. The finale will see three contestants -- LV Revanth, Khuda Baksh and PVNS Rohit -- competing with one another on a stage, which will also see a comedic act by Sunil Grover as Dr. Mashoor Gulati and Rinku Bhabhi. 'Sachin Tendulkar is a phenomenon not just for India, but for the world, especially for the world of cricket. When he is given the title of god, it's not just by chance. His whole demeanour, whole career, entire reputation and the spotless career that he has had, is the reason why he is called the God of cricket,' Sonu added. The Arjuna Award winner had earlier released his autobiography named 'Playing It My Way', and recently he launched his digital app 100MB.